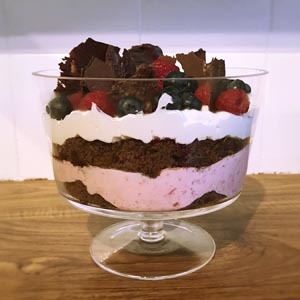 We recently made one of Helen’s Mum’s favourite desserts for Valentine’s Day, Chocolate Raspberry Towers. 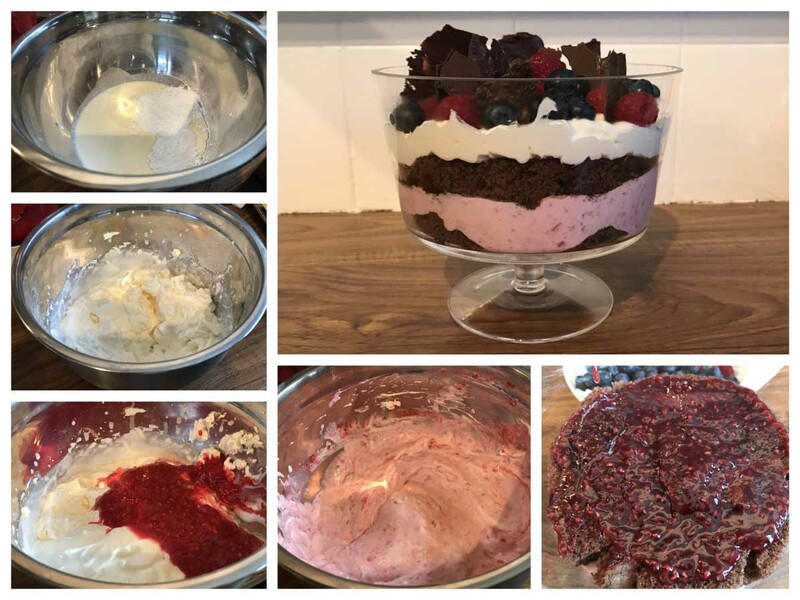 We had forgotten how nice they were and we thought that the recipe would work really well as a layered dessert. We’ve made a few changes to the recipe to allow for this. Although the dessert uses crème de cassis and dark chocolate it is extremely light and refreshing. Be warned, it is very moreish!! Pre-heat the oven to 190C. 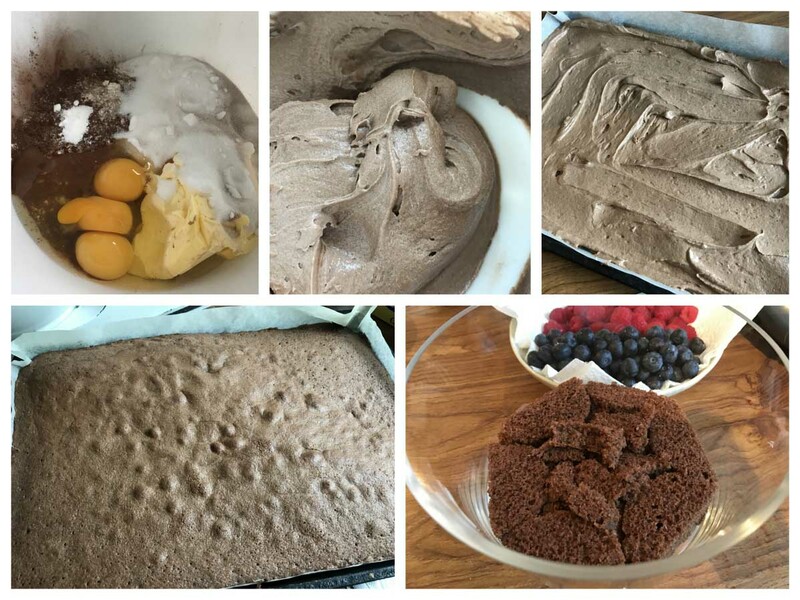 Combine the cake ingredients together (flour, chocolate & cocoa powder, margarine, caster sugar, baking powder, vanilla essence and eggs) until you have a smooth mix and add to a lined baking tray. Level the surface of the mix and bake in the oven for 20 minutes. Once the sponge is baked, set aside to cool and cut the sponge to fit inside a trifle dish (or whatever bowl you plan to use). Put one layer of sponge into the bottom of your trifle dish and spoon 1 tbsp of crème de cassis over this layer and leave aside. Blend the 150g of raspberries with 2 tbsp of crème de cassis until smooth. Next add the icing sugar to a bowl with cream and whip until stiff peaks appear, using an electric mixer. Fold the raspberry purée into the whipped cream mix and add the fromage frais. Spoon half of this mixture on top of the first layer of chocolate sponge. 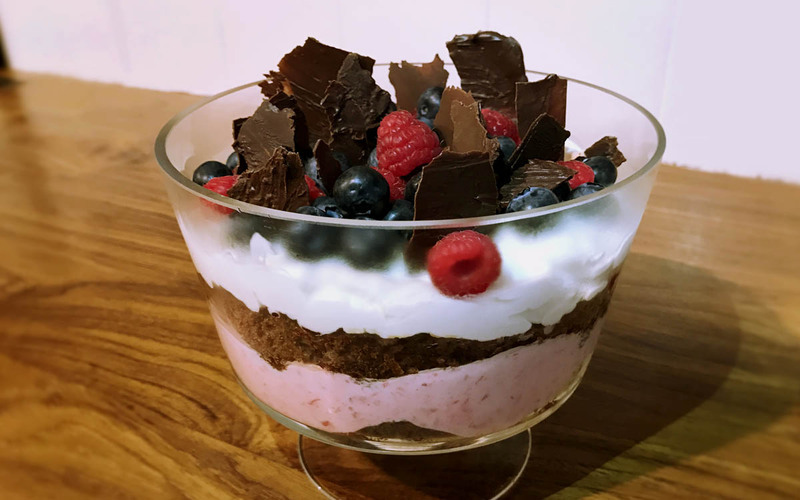 Cover this mousse layer with another layer of chocolate sponge and spoon over the remaining tbsp of crème de cassis. Add the raspberry jam and crème de cassis to a bowl and stir until there are no lumps. Now spoon this jam mixture over the second layer of sponge. Top the sponge with the remaining raspberry mousse. 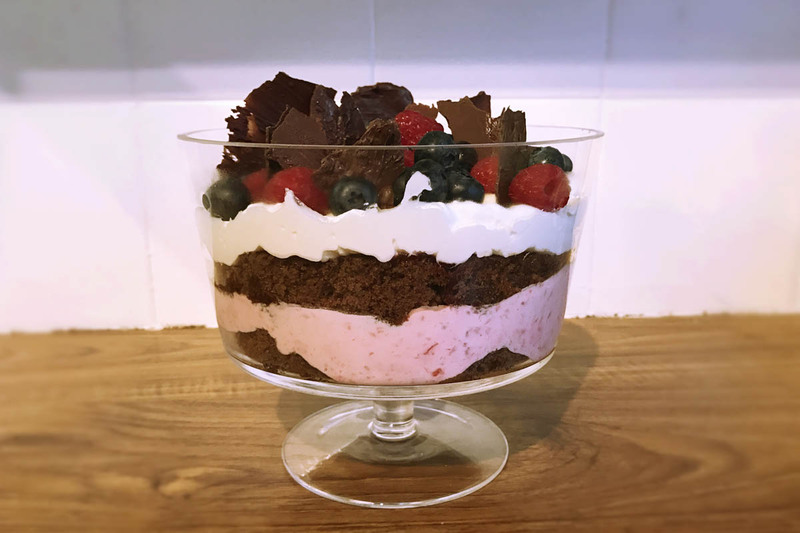 Whisk the double cream with a sprinkling of caster sugar until thick but spreadable, and spoon the cream mixture over the mousse. This is a tasty dessert as it is, but you may wish to try some alternative fruit flavours like mango, black cherry or passionfruit. These flavours would work really well with the chocolate sponge and dark chocolate shavings.